We had a wonderful event yesterday. I’ll post pictures when I get them but I took this one myself after ordering the drink of the day at the snack bar. Yes, it’s called The Book Worm. What else would you expect in a book store during an event to raise money for books for libraries? 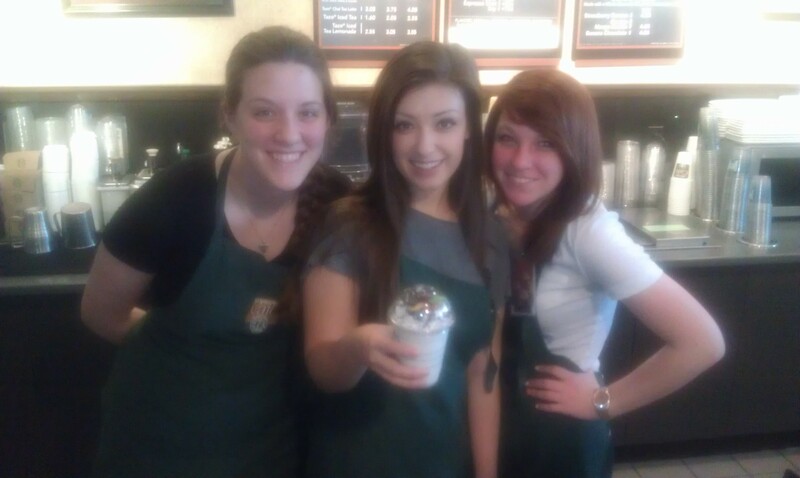 I think I ordered the first one of the day, judging from the smiles of the young women who concocted the masterpiece. I ordered two more before the day was over. Yep. That good. Dozens of families came to the store to enjoy readings by boys and girls from four Springfield elementary schools: Disney, Field, Harrison, and Pershing. Special treats included Bellatones and Brotones (acapella singing groups from Central High School) and Sequiota Singing Sensations from Sequiota Elementary. My gratitude to Chris Craig and Gale Clithero for joining me in a thirty minute performance of Byron Biggers Band! Jana Bachus swears she recorded us on her phone and intends to put us on YouTube. If that happens, I’ll post the link. We’re all grateful to Jim Troye and Renee Hunt for hosting us at Barnes & Noble and working so hard to make everything run smoothly. This is an event of the Foundation for Springfield Public Schools so thanks go to Jana Bachus and Natalie Murdock for their perfect orchestration of the day’s events. So a good time was had by all and I’m sure that we raised some money for Reading Roundup that will help fund requests by school librarians in our public schools. The event lasts through May 1 so a percent of all sales in the store continue to go the benefit of Reading Roundup. You need to present a free voucher at the register but if you don’t find one, tell the person at the register that you want your purchase to count toward Reading Roundup. A couple of days ago I also showed you how you can order online from the Springfield store to help.